In this 2-day workshop you’ll learn how to extend Agile beyond the teams by exploring practices from organizational development, change management, Agile and lean startup. Solving big problems is hard work. LEGO® SERIOUS PLAY® will help you unlock creative thinking that will help you unravel even the gnarliest of problems. We offer Agile and Professional Coach training, Management 3.0, and Lean Change Agent as well as customized Agile, Scrum Technical, and Kanban training. We provide embedded, and behind-the-scenes coaching at the individual, team, leadership, and organization layer in order to raise the quality of interaction inside, outside and across your organization. Agile has been around long enough that we know what works, and where organizations struggle. 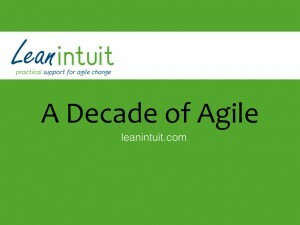 We’ve combed through each of Version One’s State of Agile Development surveys over the last decade to explore those patterns. Get our free report instantly!